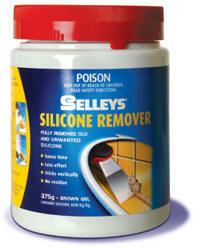 Selleys Silicon Remover can be used to easily remove old, untidy or mouldy silicon. You can then apply Selleys Silicon for wet areas which has been specially designed for bathrooms, kitchens and laundries. Cut away as much as you can, using a utility knife. Using a scraper or spatula, apply Selleys Silicon Remover over the old silicon, spreading it about 5mm thick. Wait about 2 hours and the Silicon Remover will soften the old material which can easily be scraped away. Clean up the area with a cloth soaked in methylated spirits. You’re now ready to apply Selleys Silicon for wet areas. It has inbuilt anti-mould properties and comes in a range of colours to match most colour schemes.